A campaign victory in France! 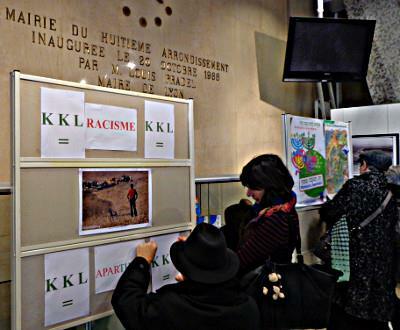 The “Collectif 69 of support to the Palestinian people” had been informed of an exhibition of KKL-JNF in the entrance of 8th district town hall of Lyon. 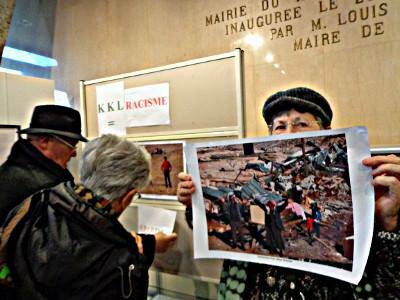 The collectif 69 published a communiqué. 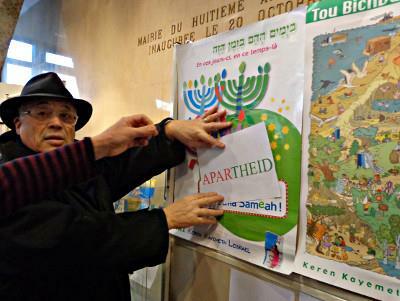 On Wednesday, more than 12 people entered the hall of the district town hall and stuck KKL=APARTHEID posters on KKL propaganda, and unfolded the Jewish Union for Peace banner where “No trade with apartheid! no crimes in our name! was written. A press photographer took pictures, the delegation met a chief of staff and an assistant of the mayor, and gave detailed explanations. During that time the chief of staff studied the BDS, UJFP websites, and studied the Prawer Plan and the Glavany (MP) report. 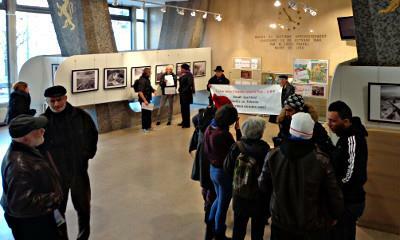 They tried to justify the exhibition on ecology grounds but were informed of what ecology means for KKL. 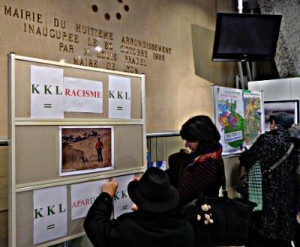 The exhibition has been removed.